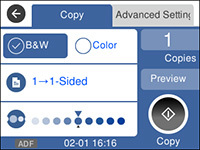 To print more than one copy, select Copies and use the displayed keypad to enter the number of copies. Select Advanced Settings to view and change additional copy settings, if necessary. Press the preset button to save your copy settings. Note: To cancel printing, select Cancel.